At Hot Ink we feel strongly about the world around us and the impact that each of us has on the environment. For several years we have made it our responsibility to research and provide our customers with a variety of greener paper choices. Following on to our practice of REDUCE, RE-USE and RECYCLE, we have OFFSET too. By offsetting all emissions created by Hot Ink, we will leave a zero carbon footprint on our earth. We have teamed up with the Climate Neutral Group to calculate our carbon footprint annually which we offset through the purchase of Gold Standard carbon credits. Initially these credits came from the Paradigm Project which is a cooking stove initiative in Kenya. In 2014 we switched to a local initiative in the Western Cape called ‘Composting in Cape Town’ and now we have invested in the ‘Wonderbag Foundation’ which is a global initiative developed in South Africa (and was recently listed as one of Time Magazine’s top 50 genius companies for 2018). WIN ONE OF THESE BAGS FOR YOURSELF: details here. 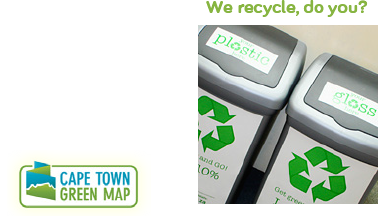 Over and above providing the best quality in Cape Town, we can now offer our customers sustainable printing solutions along with our trademark excellent service. Hot Ink was invited to become one of the Flagship Projects for the Government of the Western Capes’ 110% Green Initiative. 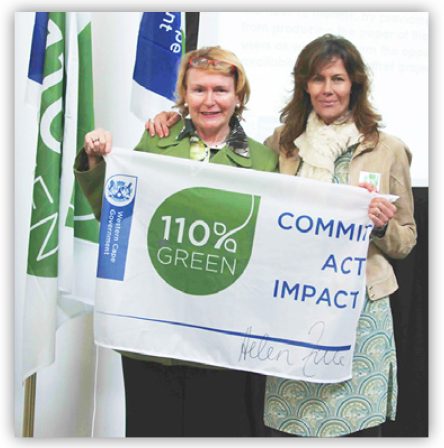 We accepted our signed flag from Premier Helen Zille in June 2013. Read more about this initiative and how you too can be involved. For more info on Choosing the Right Paper, read our guideline. PEFC: Programme for the Endorsement of Forest Certification schemes. Both PEFC and FSC are independent, non-profit, non-governmental organisations. Look out for these two accreditations. 2. Is the paper wholly or partially recycled? Recycled matter can consist of either pre or post consumer waste or have a rag (cotton) content. Bear in mind that many recycled papers undergo a chemical de-inking process to remove the ink. 3. Was the paper manufactured using acid, chlorine or other toxic bleaching agents? Some paper is only ECF (elementally chlorine free, i.e. chlorine dioxide used instead of chlorine gas) which is better but TCF (totally chlorine free) is preferable. Laser printing allows you to print only what you need resulting in less unnecessary wastage. The laser printing process uses powder toner which is more environmentally friendly than liquid inks - some of which are solvent based. Toners are fine powders composed of plastics, colorants and small quantities of functional additives. Since Xerox toners are safe and non-toxic and the product is manufactured according to strict emission standards, emissions of volatile organic compounds during printing should not be a concern. All our printer consumables are returned to Xerox for recycling and/or re-manufacturing. All paper, glass and plastic waste generated at Hot Ink is collected for recycling. All Xerox papers used are both FSC and PEFC certified. "The Complete Paper Guide 2008" - Paper Link; " Sustainability, Energy & Environment" - PrintCity; "M-Real Corporation Finland"
Hot Ink is on the"Green Map" - are you? 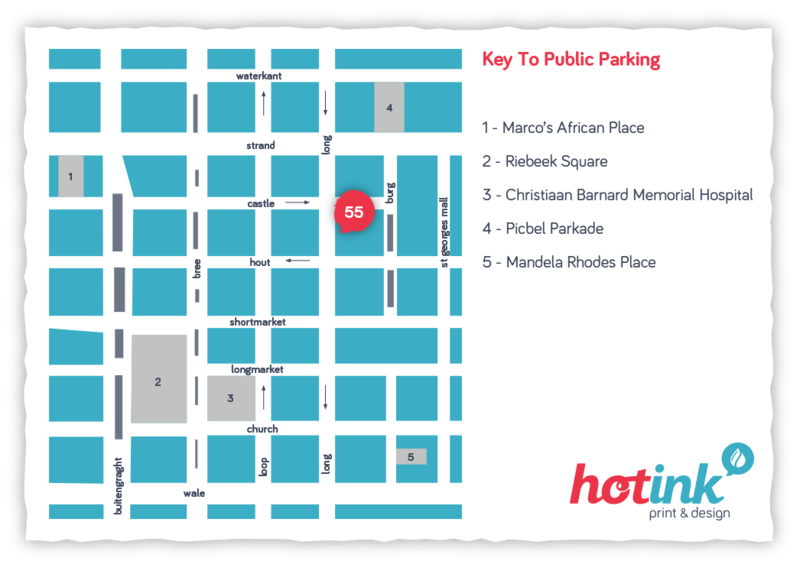 Check out Cape Towns' other "green sites"